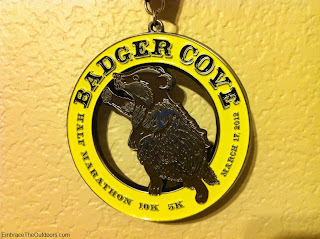 We ran the Badger Cove race at Del Valle Park. 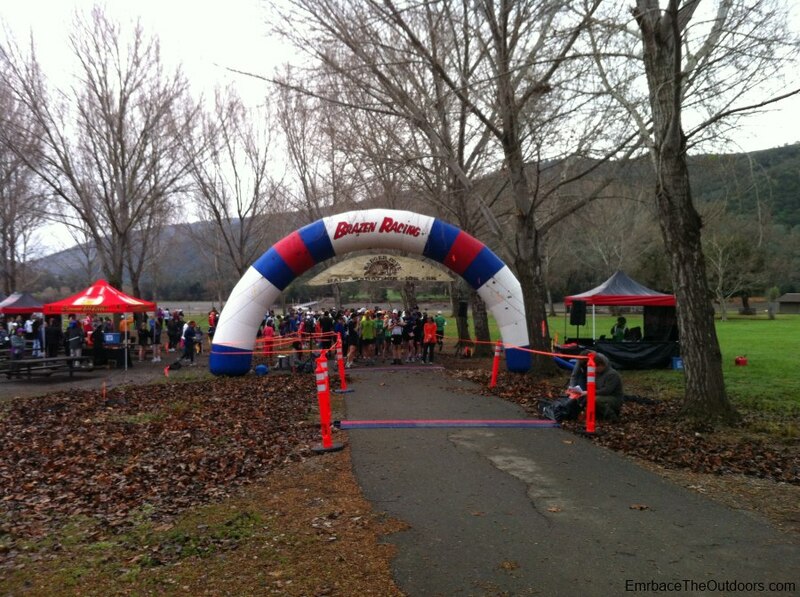 It was a trail race put on by Brazen Racing and had 5k, 10k and Half Marathon distances, with about 800 people participating. As always, the entry fee for the race depended on the race distance and date you registered but ranged from $29 to $60. 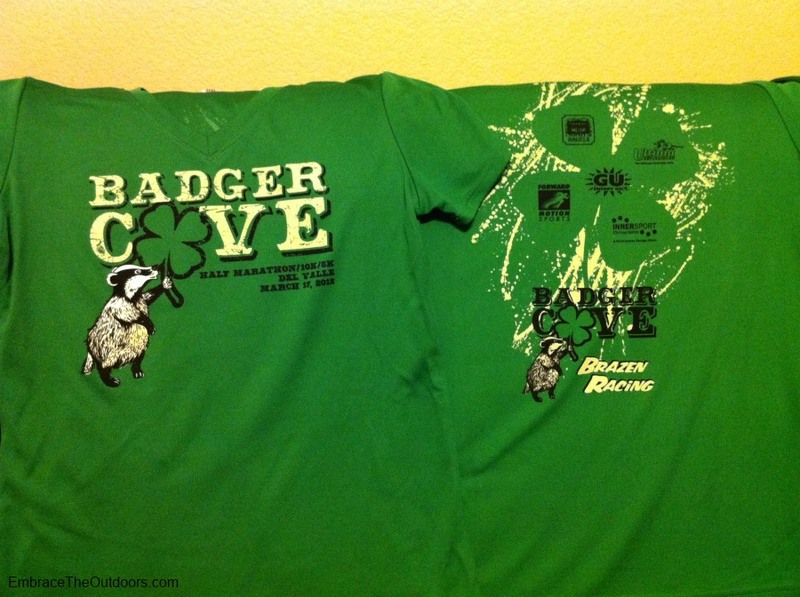 As with other Brazen Racing events there was an option to register for $5 less if you did not want the race shirt or pay $6 more for a technical fabric shirt if you registered for the 5k or 10k. 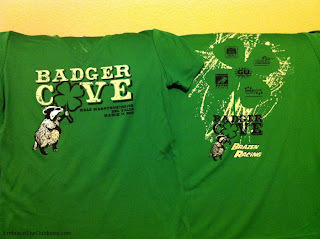 If you registered for the Half Marathon the technical fabric shirt was included. We had been to Del Valle Park in the past to camp and hike and knew that there was really only one entry lane to the park so we left with plenty of time. We paid the $6 entry fee and followed the rest of the cars to the designated parking lots for the race. It had rained the entire week leading up to the event so we expected it to be wet and muddy, which it was. There was plenty of parking with some porta potties in one of the parking lots as well as park bathrooms nearby. We had picked up our race bibs, shirt, etc a few days before the race so we got to skip that on race day. But this all seemed very well organized. There was some pre-race food too like coffee and danishes. The most difficult part of the pre-race morning was deciding what to wear for the race-gloves or not? jacket or not? I decided on no gloves, no jacket and hoped that it didn't rain during the half marathon. It was my first trail half marathon so I was nervous to start anyways and the unpredictable weather didn't help. The race was timed using D-tags which I really like because they are easy to use, disposable and not noticeable when I'm running. Races started on time with the half starting at 8am, 10k at 8:30am and 5k at 8:45am. The courses for all three distances were similar. The 5k was an out and back. The 10k was a lollipop course, with the loop being shared with the half marathon except the half marathon course covered the loop twice and had an additional out and back section about two thirds of the way on the loop. 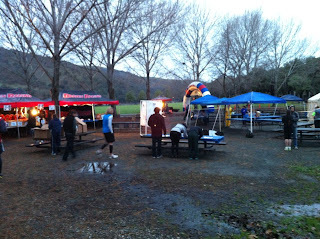 The second out and back portion of the half marathon was a last minute change since the original course was not easily accessible by the rangers to disperse aid station supplies after the heavy rain the night before. The first half mile or so of the course was paved road/sidewalks but the rest of the race routes were dirt. The out and back portion shared by all three distances consisted of some rolling hills. All distances passed an aid station twice, the half marathon passed it a third time by doing the loop twice. Initially everyone ran past the aid station and while the 5k participants turned around soon after passing it, the 10k and half marathon participants continued straight on East Shore Trail where the real climbing began. The trail at this point was very muddy making it tough to move at a quick pace and then it turned into single track for a little while with some low hanging trees. Then it was back to a wider trail on Ridgeline Trail where the climbing continued and the mud was on and off. I have hiked in muddy conditions before but hadn't run in this much mud so it was an interesting challenge. It was tough going uphill because my feet would get stuck in the mud and then downhill was a bit slippery and so I had to focus to stay upright. It was a little more climbing to the next aid station that was fully stocked with water, sports drink, GU, candies and salty snacks. Then it was a detour to the out and back section that was added to the route with the course change. More mud, more small rolling hills, and then the turn around to head back to the loop. The rest of the loop back to the first aid station was packed dirt and was overall downhill but there was one slippery muddy portion. Hetch Hetchy Trail led back to the aid station and it was a right turn to get back on the course where we had been before but this time had to share with the 5k walkers. It was a tight fit since the trail was muddy and it seemed like everyone was avoiding the mud. Some quick maneuvering got me past the 5k walkers and onto the loop again. The second time around the loop I was able to push a little more since I knew what was ahead. Some of the muddy areas were better because there was some areas that were packed down after the 10k and half marathon runners had passed through. After the second loop and to the intersection where the main aid station was it was a left turn back towards the finish. There was very little mud for the rest of the route, it was mostly packed dirt with rolling hills and then paved trail back to the finish. Soon after passing through the finish I got my finisher's medal, then water and postrace food. As always with Brazen races there was plenty of post race snacks such as fruit, bagels, coffee, hot chocolate, water, cookies, candy, ice cream, etc. Age group medals could be picked up from the awards table once results were posted. The mud made for a fun and difficult race and the fact that the rain stayed away was great. Hopefully more trail half marathons to come.